Our previous customers have said great things about our kit - "Perfect solution to decorating" "What a find" "Love the cake tools" "Outstanding selection for my kids"
THE ULTIMATE CAKE DECORATING SUPPLIES KIT FOR FOREVER LASTING MEMORIES IN THE KITCHEN! → Are you looking for fun and creative ways to get your kids involved in cake decorating? → Do you want to impress family and friends at the next gathering? → Did you promise your little one, the ultimate chocolate buttercream frosting cake? Look no further! THE FROSTINC SET IS THE ANSWER! The must-have set for ANYONE who loves cake baking and decorating. QUESTION: There are many cake decorating kits out in the market - what makes yours different? ANSWER: Our premium quality cake decorating kit is suitable for everyone. The kit includes the most favourable tools for decorating beautiful cakes. QUESTION: Is your kit safe on food and for my kids to decorate with? ANSWER: You bet. Our kit is FDA approved for use and only uses food grade materials. For kids, there are no sharp edges or small consumable items. Adult supervision is advised. QUESTION: Does it come with a money back guarantee incase I don't like it?" ANSWER: Of course! You risk absolutely nothing. 100% hassle-free money back guarantee on all Frostinc products. Don't hesitate and order TODAY - get 20% off with our discount code. ✅ PERFECTLY ASSORTED - Why buy expensive store-bought cakes? 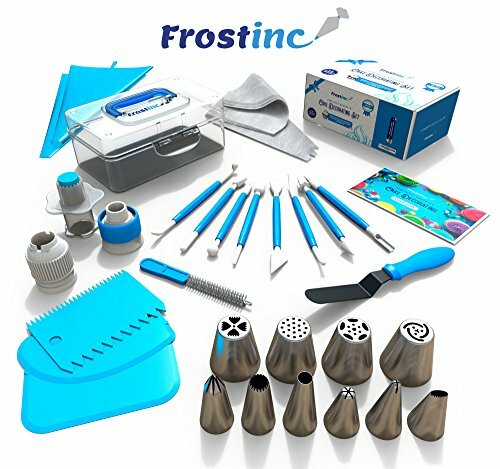 Frostinc provides all the cake tools you need to shape and decorate cake after cake with the added ENJOYMENT for less. Create the most diverse cake frosting designs with us. Unlike other kits, we've specially selected cake decorating supplies for your kitchen in this AMAZING bundle - achieve the best results to wow your friends and family. ✅ GREAT TASTE - When it comes to cake and cupcake decorating, you need the right tools in one set. Pipe and decorate with 4x russian icing tips, 6x cone icing tips, 2x couplers, 8x modelling tools, 2x heavy-duty reusable and 6x lightweight disposable piping bags, 3x cake levellers, 1x cupcake corer, 1x mini spatula, 1x instruction manual, 1x storage box and a complimentary cleaning brush. ✅ FREE GUIDE INSIDE - Buying for a child with no experience whatsoever? With such a GREAT selection of cake modelling and shaping tools, we want the task to be easy for you and those receiving your gift. Rest assured that our kit arrives with a printed instruction manual in addition to a handy ebook containing tips & recipes emailed directly to you. All of our kits have a LIFETIME WARRANTY so that you can decorate in confidence. ✅ FOOD GRADE MATERIALS - Decorate safely with our FDA approved kit - these high quality 401 grade stainless steel piping tips use non-toxic, non-stick, dishwasher safe and corrosion resistant materials. Very easy to clean with the COMPLIMENTARY cleaning brush you can find in the clear, durable and lightweight storage case. No more necessity to buy several kits to cover your cake decorating needs. Suitable for small kids too - find your ALL in ONE solution and bake in peace of mind with Frostinc. ✅ OUR PROMISE - Get your piping bags ready! Pick up our cake tools and create stunning patterns on your fresh icing, buttercream cupcakes, chocolate cookies and succulent pies. So what are you waiting for? Order with us now, become a cake decorating master and impress family and friends with beautiful cake decorating. If you aren't happy with your cake decorating supplies for ANY reason, just return it to us; we will give you a FULL refund. 100% Risk-Free, 100% satisfaction guaranteed. If you have any questions about this product by Frostinc, contact us by completing and submitting the form below. If you are looking for a specif part number, please include it with your message.